US Crop weather, the June WASDE report and an ever changing picture in Europe will dominate the headlines this week in the grain and oilseed markets. The trading for the week will start out on a positive note, as European politicians were presented with a request from the Spanish Government for a bailout of approximately $125 billion dollars (100 billion Euros), pending an audit at the end of the week. Bullish traders will see this as an act of good faith, that the powers that be in Europe will cooperate and save each other along with the commodities markets. The bears will view this is as a failure, nothing more than a political symbol that only delays the inevitable. Last week the rhetoric from several US analysts was that a bailout would need to be somewhere in the amount of 350 billion Euros in order to stabilize the situation. Regardless, in the short run, this new development may encourage further short covering in the Euro currency and foster a “risk on” atmosphere throughout every market. 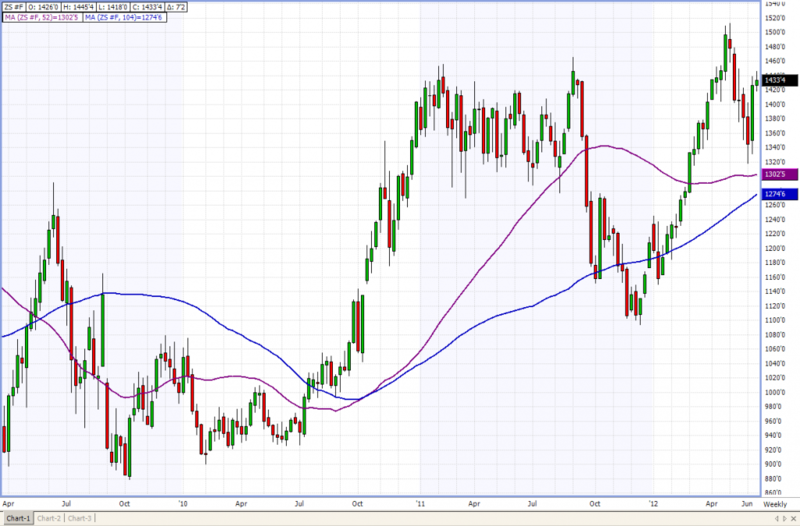 Corn and Beans should catch a tailwind from any overall shift in sentiment, away from fear and toward opportunity. The weather will be another trading factor over the short run. In average years, the weather has not been as big of an issue this early, but due to early planting, the timetable for when these factors have their most adverse affect on yields has begun earlier. I’ve talked to producers throughout different growing regions, and many are currently in pretty good shape, but will not be if they don’t get some precipitation soon. Many who invested in premium seed this summer will be interested to see if their drought resistant hybrids benefit, the technology looks like it could be put to the test early. Rain and cooler temperature are expected in most parts of the growing region early this week. Many producers may have reason to be more nervous than normal, if not substantially more so. “The Trade”will be watching the extended forecasts to see if the high pressure ridge currently on track to camp out over the highest yielding areas will come to fruition. 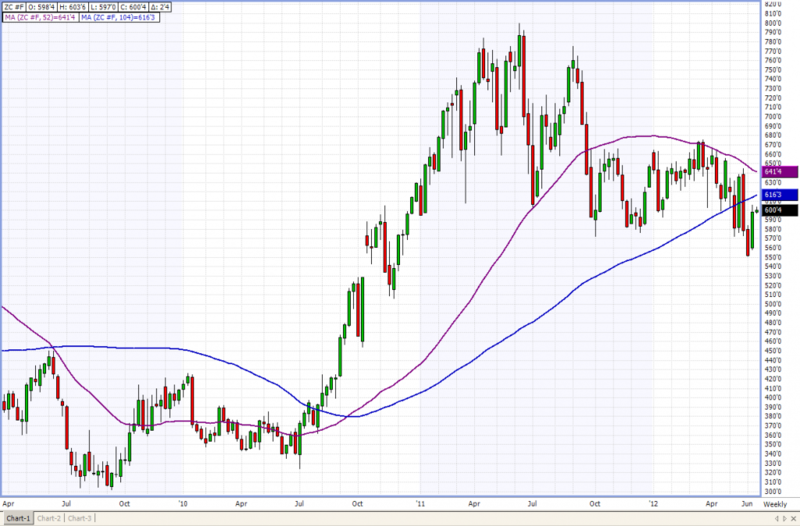 If weather does become a factor, those short the grains either on the board or in cash better be on high alert. Due to global uncertainty, much fund money has moved to the sidelines and farmers have been throwing in the towel on new crop exposure. If bushels need to be bought due to feared potential yield loss and/or funds feel like putting some money back to work we could see a significant rally. In my opinion the short covering rally we saw in wheat a few weeks ago will look mild, compared to the potential squeeze that could come from bean and corn production losses. The USDA dominates the early-week schedule with a crop progress report on Monday, and the much anticipated June WASDE report on Tuesday. Later in the week, the industry will focus on some important U.S. economic data involving the Producer Price Index and Consumer Price Index. The results of the latest index change will surely affect how traders position themselves ahead of the next FOMC statement on June 20th. On Tuesday at 7:30 A.M. the USDA will release their World Agriculture Supply and Demand Estimates report. This report is typically not a huge market mover, with the USDA only changing their yield expectations four times in the last nineteen years. I don’t see any reason for numbers to be changed thus far. The early pace plantings and emergence, along with the decent weather for the growing season does not give the USDA enough reason to lower their numbers. That said, be ready for bullish surprises, due to the massive liquidation in corn over the last 3 months, there is plenty of dry powder sitting on the sidelines waiting to pounce and make the shorts uncomfortable. This report will be significant for another reason besides the release of data. This will be the first report that will be released since the CME opened the markets 21 hours a day last month. In past reports, the markets would close and then the data would be released. Participants would have 2 hours to read the report and adjust their plan. When this report is released, both the Globex and Chicago floor will be open, so price discovery will be available instantly. I was on the floor on Friday and many traders are concerned that we will see massive moves in both directions, creating a big whipsaw effect. For those who are newer traders, I would advise staying out of the fray for a few minutes after the report is released. We will get used to these new rules, but it will take time. Don’t let the initial price action dictate your plan! CORN — Market is basing just below its yearly and 2 year moving average. The long term trends continue to favor the bulls, but rallies that fail at those moving averages could indicate a long term trend change has been made. SOYBEANS — This market is still well above its moving averages. Fundamentally cash beans are strong. 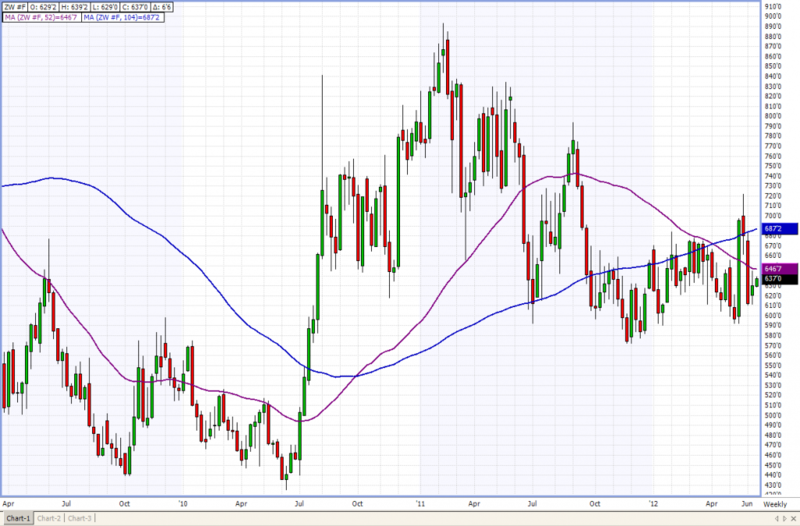 CHICAGO WHEAT — Like corn, wheat is below its 1 year and 2 year moving averages. A surge beyond those markers, especially going into the harvest, could indicate a long term trend change. Our section dedicated to teaching you something new each week. Did you know about grain Calendar Spread Options? For those who trade the spread markets, Calendar Spread Options are options on the price differential between 2 contract months, rather than on the underlying asset itself. Therefore, they offer alternative hedging capabilities compared to standard options, and can provide a more precise hedge against adverse movements in price spreads in the grain and oilseed markets. Calendar Spread Options are sensitive to the value and volatility of the spread itself, rather than the price of the underlying commodity. They are more efficient than combining options on 2 different months in an effort to replicate the spread, and provide a better risk management device for hedgers and market participants exposed to calendar spread risks. *Consecutive month spreads will trade all year, the first-second month spread options will expire and roll into the next month after the option expiration of the front month individual options. These are great hedging tools that are seldom used. For further questions about how these options can help your risk management, please don’t hesitate to give me a call at 866-675-8766.